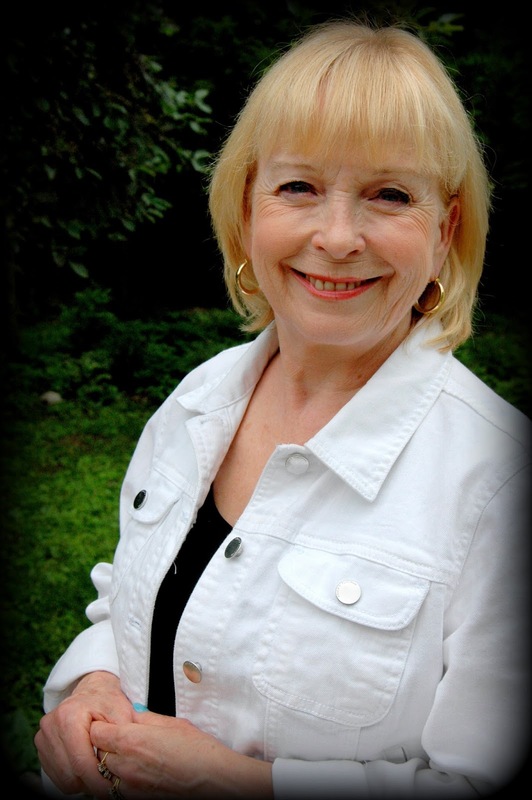 Cozy Chicks: Time to toss the old author photo - eek! Time to toss the old author photo - eek! It’s that time that all authors seem to dread. Well, those of us past the first flush of youth do. I speak of that iffiest of images: the author photo. We need our photos. They are our introduction to you, our readers. They need to look like us, only better. However, if they look too much better, we then seem ridiculous. You see the problem? Makes me want to pull a balaclava over my head. It would solve the wrinkle problem. I find that photos either make me look either much better or much worse than the real me. Naturally, I prefer the better version. I also like a “sort of” natural look (except for my blue nails and my prematurely blonde hair). Ever since the time I had professional photos taken and the photographer airbrushed out every wrinkle and one of my ears, I’ve asked my daughter, Victoria, to take my pix. She has let me keep my ears and some of the wrinkles. Sweet girl. Where was I? Oh yes, after five years, I desperately need that new photo. You see, I have a new hairstyle since the last one, I’ve also lost a bit of weight, and I have been found by a few more wrinkles. Apparently, I look quite different. I sat across from our own Maggie Sefton at dinner at a recent conference and I had to introduce myself. She said it was the hair. But could it have been that old photo? So those are my two choices. Victoria did a good job with soft light, a filter and a bit of magic. The balaclava covers a multitude of flaws and you didn't get to see the rejects. Would you like to vote on the one you think I should use? And yes, none of the above is an acceptable answer. By the way, Victoria and I also had a great time taking our new shots as Victoria Abbott - our pen name for our collaboration on the book collector mysteries. We hope to share those with you as we prepare for the release of The Wolfe Widow. Have fun and pick one. If my feelings are hurt, I’ll just have a martini. Surely, it will be five o’clock somewhere. Maybe we’ll get a shot of that. LOL, MJ. :) It was the hair. You wore it up in what we used to call a "twist: for years. I like the new photo. You look real and approachable and very pretty. P.S. My blonde hair is mainly courtesy of Garnier Fructis No.93, Honey Blonde. My blonde magically appeared after a significant birthday. Before that red had magically appeared for too many years to remember. Thanks for your kind words, Denise! Love the photo!! Open, real, professional, but fun. I'd like to sit and talk with someone like this--without the helmet! It's ALWAYS five o'clock.... somewhere. Definitely, the new photo......great hair, great smile.......go girl!!!! Mary Jane, you are beautiful. Full stop. Love the photo!!! The new photo is great. I used to color my hair but about 12 years ago I got tired of it.. Let it grow out and now people say they love my hair. Funny they didn't say that when I was a blond. Getting a perm today.. I just can't give that up. Tres chic! Looking forward to seeing the new author photo of Victoria Abbott, in place, on the flyleaf of the new book. You look beautiful in the new photo. Very flattering. I gave up coloring my brown hair about 10 years ago and have a gorgeous head of silver hair. I can't imagine another color at this point for myself. But, your blond looks so perfect for you. Hey! I am prematurely blond too ;-). My home office is in a small room with a mirrored closet on one side. Sometimes I think I need to put up some posters. You could get a co-author like Donald Bain has and put her picture on your books. Jessica always looks terrific. Seriously, I always look at the author photo and read the bio info so I guess it is important. The photo looks really terrific (although I can see where a balaclava might come in handy for quick shopping trips). I do like your new picture, so be confident to use it. Your daughter did a great job. Author pictures are very important so your fans can recognize you at a convention. Or in the supermarket. I prefer the ninja look. Not that the other photo isn't great—it is—but the ninja look is much more mysterious! Who wouldn't buy a book from the Mystery Ninja? Either way, a martini always makes it better. Thanks, Patricia. I'd love to talk to you sometime and will leave the balaclava at home! I hear you, Denise. I know a woman like that and she's always sticking her head into my pix! Thank, Mary! Blondes have much more fun except when technology is involved. Then, it's very very bad. Thanks so much, Karen. Of course, it's all in the lighting. I love your hair color, Diane! It's very elegant. If mine wasn't eight different colors under here, I'd go natural. Soon soon. Thanks, Nancy! They never use them. We'll make sure it's all over the place though. There's always something, isn't there, Diane! Your photo looks terrific though. I would kill for silver hair lkie yours, Linda. I love it (but under the blond there's a lot of multi-color action going on). I am sitting next to Erika Chase on the train right now and hers looks great too. Might have to push her onto the track. Nudge wink. Thank you! 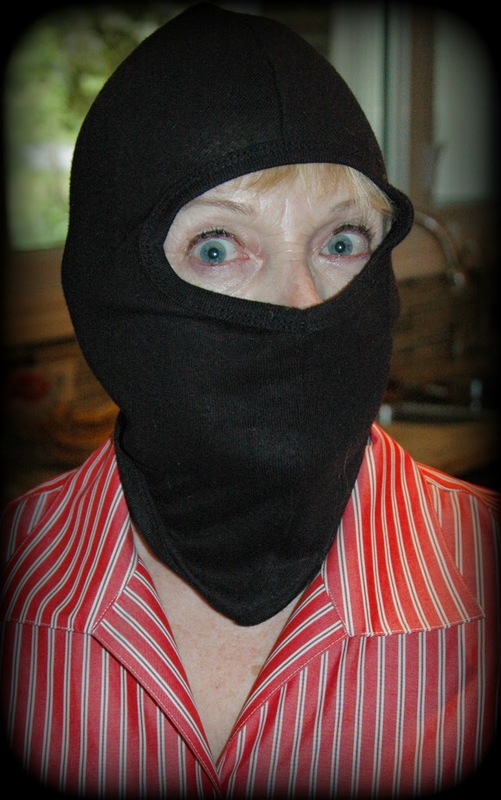 I will use it and the balaclava will get out and about too. I hear you about the mirrors. Thanks, Aurian. I find I only run into people I know on bad hair days or if I've been working in the garden. Darling Dorothy! You are so right. I think the ninja might add a martini to the mix. Thanks Mary. The back of my hair is not as white as the front.. I think it is turning but not fast enough for me.. I see you are sticking to your story, Maggie! So glad. I think I'll take the balaclava off now! Your picture is lovely, but I understand the drama of getting a good one. I totally HATE having my picture taken. With candid shots, I'm usually doing strange things with my face (I have a bad habit of licking my lips a lot, and it can make for some very odd pics). Posed pictures are just as bad. I think I may have a "magic mirror" in my bathroom, because when I leave there most mornings, I think that I'm OK to go out without a bag on my head. But when I have pictures taken, I can't believe how the "real" me looks. That's why I always volunteer to TAKE the pictures - I'm much more comfortable behind the camera. I hear you, Lynda. I'm always getting got with a large mouthful of food. Also known by my girls for phony smiles number 1, 2 and 3. The one with the balaclava would look funny on a book but you could always wear a fedora for that detective look. I love the new photo. Great idea! I have two fedoras - winter and summer. Thank you, Michelle. Snort! I hear you Liz. I have a couple of Sisters in Crime tee-shirts and that's bad enough. Hugs from Bloody Words in Toronto. Thanks so much! What a nice thing to say. Have a wonderful nice person day. I wish my hair would turn blonde instead of gray. You look gorgeous!